It has been said that people are our greatest resource. With the coming 200th Anniversary of the War of 1812, let us take a moment to remember a few of those who took part in this bit of our nation’s history. A special thanks goes out to Shawn Doyle, Richland Town Historian and president of the Half-Shire Historical Society for taking us on a cemetery tour to learn about these local heroes. One of the oldest soldiers to serve in the War of 1812 was Lt. Colonel Hezekiah Cole. He was born in Rhode Island in 1765 and later moved to the town of Richland. 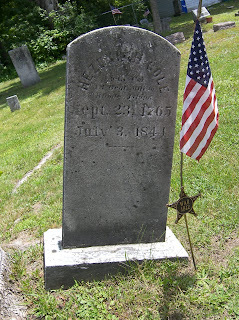 Hezekiah served in the 13th Rhode Island Militia after the Revolutionary War and through the War of 1812. He and his wife Bethani Arnold brought up seven children: Arnold, Lucia, Tabitha (Samuel Cole), Sally (Samuel Fox), Anne, Richard, and Emery (Harriet). Hezekiah died in July 1844 and now rests in the Riverside Cemetery in Richland. Ensign Samuel Dunlap joined his brother Captain Smith Dunlap in the War of 1812. Samuel was born in Fonda, New York in 1785 and later relocated to the town of Richland. He wed Sylvia Robbins of Keene, New Hampshire in September 1811, less than a year before the war began. Samuel’s adopted daughters, Polly Ann (George R.F. Campbell) and Mary Jane (Jewitt S. Ames) evenly inherited his lands upon his death in September 1853. 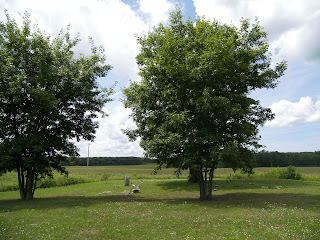 Samuel operated a tavern on the old Ridge Road near where he is buried in the Ferguson-Blue Springs Cemetery in Richland. 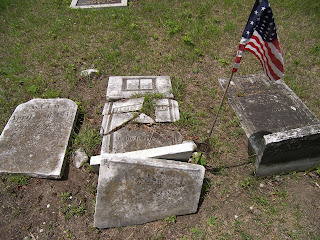 “We lived there (Long Island) until I was 12-years-old, which was in April previous to the Declaration of Independence. And in 1776, I remember hearing the roaring of the cannon at Long Island, York Island, Flat Bush and also when the Phoenix and Rose went up the North River. I think my father, a Whig, and three sons (Charles, Ira and Jehiel) were then in the United States Army. In 1777, my father came home. Got his family off the island in 1778 and landed near Norwalk Connecticut, then went into South Salem where the family resided until 1782. John served four tours as a private between October 1780 and June 1783. After the Revolutionary War, he met his bride Mary Townsend of Shrewsbury, Massachusetts while residing in the lower Hudson River Valley. In 1790, the couple joined several family members and relocated to Rupert, Vermont. John purchased 100 acres and held several government posts, including: Tythingman, Surveyor of Highways, and Collector of Taxes. It was during this time that John was called back to service for the War of 1812. John and Mary raised 13 children: Ira Charles (Thankful Phillips); William (Cynthia Phillips), (Freelove Thankful Parker); Lydia (Isaac Price), James (Ruth Nelson), (Betsey Flower); Joanna (Simeon Doane); Betsey (Reuben Peck); Rebecca (Ralph Price); Susan (Horace A. Phillips); Amanda (William Kilburn); Polly (Ralph Price); John (Emily Frary); Hoyt (Harriet Maltby); and Townsend (Almira Maltby). In 1825, John and Mary moved to the town of Richland to join their children and neighbors. 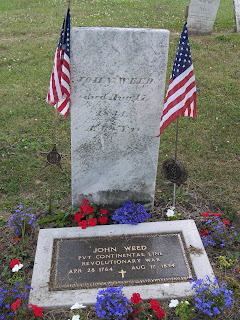 John died in 1834 and is buried in the Pulaski Village Cemetery. Our ancestors have many fascinating tales to tell. Thus, we begin this series to commemorate our local heroes of the War of 1812. Please let me know if you have a story that you would like to share with the rest of the group. You'll find my contact information listed above on the right.